We all love sweet treats during the festive period – and here at Skandiblog we thought we’d point you in the direction of some yummy Scandinavian desserts this Christmas. We think they will make great additions to your Christmas table! We’ve included links to the recipes so you can try them for yourself. Brune pinner – Cinnamon cookies. A Norwegian favourite, Brune pinner are cookies baked with cinnamon and dark brown sugar. Perfect paired with a generous glass of Glogg by the fire for an evening sweet snack! Here is a recipe from NordicDiner on how to make the perfect Brune pinner! Kransekake is not a cake for the faint hearted baker. A tower of cake rings made with almond, sugar and egg whites, this is definitely a centrepiece for the Christmas table! We love the Bake Off’s Paul Hollywood’s take on the classic, read it here. Another perfect accompaniment for the mulled wine drinker – Pepparkakor are Swedish ginger biscuits. You can keep them simple with cookie cutters and icing, or go the whole hog and try this pepparkakor christmas wreath! A traditional Danish dish typically eaten on Christmas day – risalamande is rice pudding often flavoured with almonds. In Denmark and other Scandinavian countries a whole almond is planted in one portion of the risalamande. Whomever finds it wins a prize! Click here for a danish rice pudding recipe with plenty of cream! Translating as ‘Christmas bread’ this Norwegian sweet snack is cardamom scented, and ‘studded with raisins and candied citron’. Perfect served with either sweet or savoury toppings, Julekake will definitely leave you feeling warm and content this Christmas! Click here for Outside Oslo’s recipe. 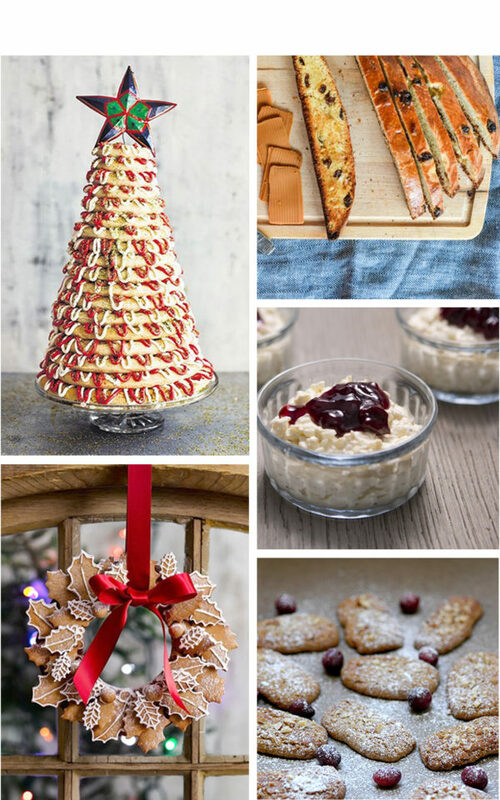 Visit our ‘Taste of Scandinavia’ Pinterest board for our festive treats inspiration and more!